Although not all clinical signs are overt, being overweight has been associated with many conditions that put a patient’s health at risk. Most data show only an association between obesity and disease, rather than direct causation; however, as evidence accumulates on the correlation between excess weight and disease, it is fair to assume that being lean is healthier. Some of the most compelling evidence that obesity is harmful to the quality and quantity of life in pet dogs is easy to relay to owners. A lifetime study of Labrador retrievers found that dogs with an ideal body condition score (BCS) of 4/9 to 5/9 lived a median of 1.8 years longer than their slightly overweight counterparts with a BCS of 6/9 to 7/9.4 The slimmer dogs also had delayed onset of chronic illnesses. Although some owners have expressed guilt or fear about depriving food as a rationale for not initiating weight loss plans, one study has shown decreased quality of life when pets are overweight and improvement in quality-of-life measures (eg, vitality, emotional disturbance, pain) after successful weight loss.5 Discussing the deleterious consequences of obesity and the benefits of weight loss may help alleviate owner concerns regarding weight management plans. One heavily studied disease process associated with the mechanical and functional effects of obesity is osteoarthritis. Maintaining an ideal weight has proven benefits in the prevention and treatment of this debilitating condition. In dogs, obesity has been related to increased inflammatory mediators, hypercholesterolemia, hypertriglyceridemia, hyperinsulinemia, increased circulating leptin levels, and decreased circulating ghrelin levels.10,11 Because these endocrine-mediated changes may lead to such diseases as pancreatitis and diabetes, biochemistry panels are recommended in overweight pets without signs to monitor for abnormalities before diseases become apparent. In addition, because hypothyroidism is known to cause weight gain in dogs, thyroid levels should be checked routinely to rule out this disease. Of note, many overweight dogs have normal thyroid levels. Subclinical conditions can be challenging to discuss with owners of overweight pets because the consequences are not readily apparent; however, the ideal time to address weight management is before signs become evident. Obesity in dogs has been associated with various cardiac and respiratory conditions (although dogs are not at risk for coronary artery disease as are humans). Mild cardiac changes were noted in experimental studies of weight gain in dogs,12 and resting and recovery heart rates were also shown to be affected by BCS and exercise in pet dogs.13 Most notably, obesity has been linked to airway dysfunction14 and tracheal collapse.15 Although the exact benefits have not been studied, weight loss is considered part of the standard treatment for many respiratory conditions, including those previously listed, laryngeal paralysis, and others. In cats, diabetes is the clinical consequence with the strongest correlation to obesity. Not only is obesity a risk factor for diabetes,16 but weight loss is a mainstay of treatment for diabetic cats and increases the likelihood of remission.17,18 Because significant endocrine-mediated changes can be evident on laboratory screening before clinical disease is apparent, biochemistry panels (looking for hyperglycemia and altered lipid profiles) are routinely recommended for any overweight cat. Insulin sensitivity can decrease with obesity, and glucose tolerance and lipid profiles can be altered in cats with excess weight.19-21 Such impaired insulin sensitivity has been associated with obesity, even in cats younger than 1 year of age,22 highlighting the need for preventive and aggressive weight management. in cats are warranted, obesity in dogs has also been linked to functional and structural changes in the kidneys, suggesting that obesity may be a potential risk factor for renal disease as well in other companion animals.24,25 Encouraging physical activity and environmental enrichment may help cats maintain a healthy weight and reduce the risk for lower urinary tract disease. Studies in humans and other animals have shown the important role of adipose tissue in maintaining healthy weight. As an individual becomes heavier, adipose tissue increases the production of hormones and inflammatory mediators (eg, adipokines [leptin]) that can have considerable clinical and subclinical effects on the body.10 These effects can predispose to or exacerbate diseases through a proinflammatory process (ie, adipose tissue producing inflammatory cytokines [tumor necrosis factor-α, interleukin-6]).10,26 In cats, hypothyroidism is rare and usually only seen as a result of iatrogenic overtreatment of hyperthyroidism. However, many subclinical changes that occur in overweight cats can be assessed on biochemistry panels before clinical disease becomes apparent (eg, hyperglycemia, hyperlipidemia).19-21 Subclinical conditions can be difficult to discuss with owners, but diabetes in particular is best diagnosed early in cats, as prevention is easier than treatment. Evidence has shown that obesity can be harmful to cats with regard to quality and quantity of life. Although anecdotal, evidence from canine studies can be extrapolated to cats. Like dogs, cats with an ideal BCS are likely to live longer and have a better overall quality of life than their overweight counterparts.4 Likewise, owners may have feelings of guilt or fear about depriving their cats of food as rationale for not initiating weight loss.5 Discussing the potentially severe consequences of obesity and the benefits of weight loss for improving quality of life and alleviating pain and suffering may help lessen owner concerns about implementing weight management. Even if signs are not apparent, obese patients reportedly have higher anesthetic risks and medical costs and require special consideration when dosing medications with narrow safety ranges.27,28 Excess weight is easier to prevent than treat, so conveying the urgency of weight management before consequences are apparent can help keep patients healthier and happier. DEBORAH LINDER, DVM, DACVN, is head of Tufts Obesity Clinic for Animals and volunteers with Tufts Paws for People Animal Visitation Group. Her interests include obesity management and client education. Dr. Linder’s research investigates safe and effective weight loss strategies for pets and the effects of obesity on animal well-being. Dr. Linder earned her DVM from Tufts Cummings. 1. Prevalence and risk factors for obesity in adult dogs from private US veterinary practices. Lund EM, Armstrong PJ, Kirk CA, Klausner JS. Intern J Appl Res Vet Med 4:177-186, 2006. 2. Prevalence and risk factors for obesity in adult cats from private US veterinary practices. Lund EM, Armstrong PJ, Kirk CA, Klausner JS. Intern J Appl Res Vet Med 3:88-96, 2005. 3. A cross-sectional study to compare changes in the prevalence and risk factors for feline obesity between 1993 and 2007 in New Zealand. Cave NJ, Allan FJ, Schokkenbroek SL, et al. Prev Vet Med 107:121-133, 2012. 4. Effects of diet restriction on life span and age-related changes in dogs. Kealy RD, Lawler DF, Ballam JM, et al. JAVMA 220:1315-1320, 2002. 5. Quality of life is reduced in obese dogs but improves after successful weight loss. German AJ, Holden SL, Wiseman-Orr ML, et al. Vet J 192:428-434, 2012. 6. Obesity, its associated disorders and the role of inflammatory adipokines in companion animals. German AJ, Ryan VH, German AC, et al. Vet J 185:4-9, 2010. 7. The effect of weight loss on lameness in obese dogs with osteoarthritis. Marshall WG, Hazewinkel HA, Mullen D, et al. Vet Res Commun 34:241-253, 2010. 8. How long and low can you go? Effect of conformation on the risk of thoracolumbar intervertebral disc extrusion in domestic dogs. Packer RM, Hendricks A, Volk HA, et al. PLoS ONE 8:e69650, 2013. 9. Does body condition score increase recovery time in dogs treated with hemilaminectomy for acute onset disc rupture? Williams CC, Barone G. JVIM 26:690-822, 2012. 10. Endocrinology of obesity. Kil DY, Swanson KS. Vet Clin North Am Small Anim Pract 40:205-219, 2010. 11. Influence of obesity on plasma lipid and lipoprotein concentrations in dogs. Jeusette IC, Lhoest ET, Istasse LP, Diez MO. Am J Vet Res 66:81-86, 2005. 12. Cardiac effect of short-term experimental weight gain and loss in dogs. Pelosi A, Rosenstein D, Abood SK, Olivier BN. Vet Rec 172:153, 2013. 13. Heart rate of pet dogs: Effects of overweight and exercise. Kuruvilla A, Frankel TL. Asia Pac J Clin Nutr 12 Suppl:S51, 2003. 14. Association of expiratory airway dysfunction with marked obesity in healthy adult dogs. Bach JF, Rozanski EA, Bedenice D, et al. Am J Vet Res 68:670-675, 2007. 15. Tracheal collapse in the dog-is there really a role for surgery? A survey of 100 cases. White RAS, Williams JM. J Small Anim Pract 35:191-196, 1994. 16. Associations between body condition and disease in cats. Scarlett JM, Donoghue S. JAVMA 212:1725-1731, 1998. 17. The role of diet in the prevention and management of feline diabetes. Zoran DL, Rand JS. Vet Clin North Am Small Anim Pract 43:233-243, 2013. 18. Comparison of a low carbohydrate-low fiber diet and a moderate carbohydrate-high fiber diet in the management of feline diabetes mellitus. Bennett N, Greco DS, Peterson ME, et al. J Feline Med Surg 8:73-84, 2006. 19. Insulin sensitivity decreases with obesity, and lean cats with low insulin sensitivity are at greatest risk of glucose intolerance with weight gain. Appleton DJ, Rand JS, Sunvold GD. J Feline Med Surg 3:211-228, 2001. 20. Glucose tolerance and insulin response in normal-weight and obese cats. Nelson RW, Himsel CA, Feldman EC, Bottoms GD. Am J Vet Res 51:1357-1362, 1990. 21. Effects of obesity on lipid profiles in neutered male and female cats. Hoenig M, Wilkins C, Holson JC, Ferguson DC. Am J Vet Res 64:299-303, 2003. 22. 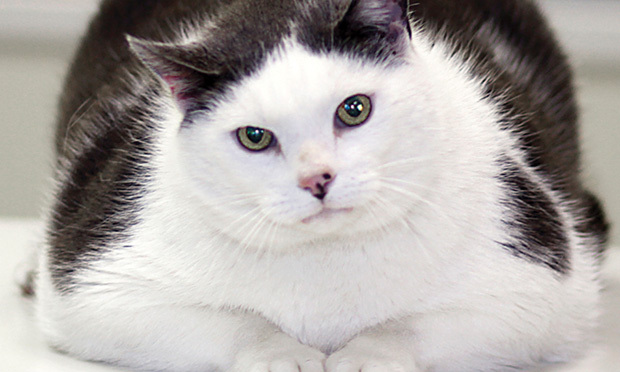 Overweight and impaired insulin sensitivity present in growing cats. Häring T, Haase B, Zini E, et al. J Anim Physiol Anim Nutr (Berl) 97:813-819, 2013. 23. Cats and calcium oxalate: Strategies for managing lower and upper tract stone disease. Palm CA, Westropp JL. J Feline Med Surg 13:651-660, 2011. 24. Functional and structural changes in the kidney in the early stages of obesity. Henegar JR, Bigler SA, Henegar LK, et al. J Am Soc Nephrol 12:1211-1217, 2001. 25. Effect of weight loss in obese dogs on indicators of renal function or disease. Tvarijonaviciute A, Ceron JJ, Holden SL, et al. JVIM 27:31-38, 2013. 26. Obesity in dogs and cats: A metabolic and endocrine disorder. Zoran DL. Vet Clin North Am Small Anim Pract 40:221-239, 2010. 27. Busulfan dosing in children with BMIs ≥ 85% undergoing HSCT: A new optimal strategy. Browning B, Thormann K, Donaldson A, et al. Biol Blood Marrow Transplant 17:1383-1388, 2011. 28. The effect of body condition on propofol requirement in dogs. Boveri S, Brearley JC, Dugdale AH. Vet Anaesth Analg 40:449-454, 2013.